appeal to me in so many ways. First up, puzzles! Second, the game is played in the real world. It’s basically my dream situation. Think gameplay of an escape room but played in your local park, or a pub, or anywhere else you can imagine. While Agent November is based in London, and standard games are played in a local building or out on the streets, you can have the game be brought to you, and play in a location of your choice. We played, Major X Ploe-Shun, one of three current missions on offer, which has a 50% success rate. We were surprised at how well the mission can be played in a small exhibition booth, but despite the tight fit, once we got started we really enjoyed solving the puzzles. Our mission was to defuse an EMP device, by finding keys, codes and passwords to progress. We were so engrossed in the mission, that we completely failed to notice a murder occurring right next to the booth, but we did get third place on the leaderboard! We probably could have spent most of the day with the team behind these two games. They’re both right up our street, which isn’t surprising, considering Cards Against Humanity is our all time fave party game. Guards Against Insanity is both a stand alone game, and an add on to Cards Against Humanity. If you’re not familiar with the concept, each person draw ten white response cards, and player take turns to draw one black question card. The remaining players anonymously submit their funniest, dirtiest, inappropriate answer card, and the player who asked the question picks which one they think is best. Confessions is a party game designed to be played with good friends, just don’t bank on still being friends by the end of it. Players take turns at picking a confession card and reading it aloud, ending the statement with either a truth, or a lie. It’s then up to the other players to determine if the confessor is telling the truth or not. We loved pay testing both these games, and we have a copy of each, so full reviews will be coming soon! What we love most about Sub Terra is it’s back story. 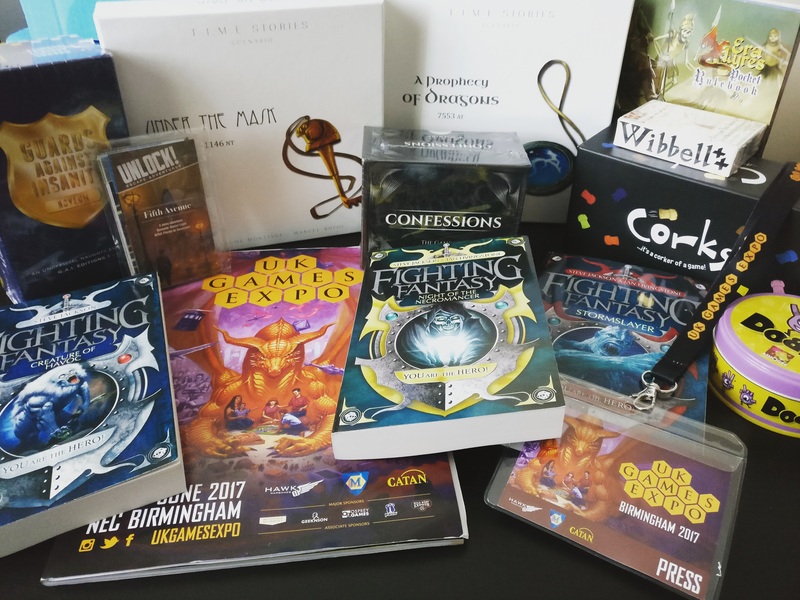 Creator, Tim Pinder attended UK Games Expo in 2016, and took part in Wyvern’s Lair, where he pitched his game idea to a panel of judges, including Peter Blenkharn, Managing Partner of Inside the Box Games. The publisher approached Tim after the pitch, and the rest is history! Now, one year on, we’re play testing Sub Terra, in a freaking cave at UK Games Expo 2017. The game is simple, you work cooperatively to escape a cave, each character has special abilities, and at the end of each round a disaster strikes the survivors and potentially hinders your progress. While not exactly reinventing the wheel, in an age of increasingly complex tabletop games, we loved the simple, yet incredibly well executed concept. The board looks great (and we love the addition of UV in the design), the random elements (map placement & disasters) ensure each game is different, and the character abilities add interesting tweaks to tactics and gameplay. While we only got a quick run through of the game during the expo, it’s one we would be eager to play again, and can confidently recommend to anyone looking for an interesting yet fun and simple strategy game. This game is very special to us. In fact. I’m tempted to say it’s my favourite from the whole expo, and here’s why. Escape the Dark Castle is a casual cooperative adventure game, reminiscent of the old ‘choose your own adventure’ books, or text based computer games from the early 90’s. Each game uses only 15 of the available 45 chapter cards, meaning no two games are alike. Characters are chosen from a choice of six, and each has varying levels of skill, (might, cunning and wisdom) so choose your team wisely! Combat and skill checks are resolved with dice rolls, so be prepared for the element of luck to play a huge part in your success or failure. But one thing I love most about this game is the storytelling aspect. Your 15 chapter cards reveal your characters’ journey as they try to escape the castle. For me, I adore adventure stories, but I could never get the hang of fully immersive games such as Dungeons and Dragons. I don’t seem to have the capacity to role play to that extent. Escape the Dark Castle provides the perfect medium ground for me. The storyline is set for you but you’re still give the chance to interact, and it is in the choices you make that your progress is determined. Escape the Dark Castle is a perfect gateway game into the world of adventure and role play. The game take minutes to setup and rule are very easy, yet the game also has huge replayability. This game has re-ignited my passion for fantasy adventure, but don’t be fooled, as easy as the game is to pick up and play, actually escaping is most definitely a challenge only the most mighty, cunning, and wise will pass. Last year, we ended up leaving the UK Games Expo extremely excited about this game. Penned the World’s first episodic, comic book miniature board game, we haven’t stopped thinking about it since, so finally having the opportunity to play is something we were hugely looking forward to. Obviously this is not a game you can fully experience in 30 minutes, but the team at Z War One had put together a demo mission for the expo so we could get a feel for the game without spending two hours on a full mission. We played Damnation, the original game, but we also had a peak at Exodus, the new standalone spin off game with a lean more towards crafting and a touch less storytelling. Even though you can’t really get a feel for a full campaign playing a demo, we were already sold on the storytelling and progression aspects of the game (we forgot to mention your characters gain XP during each mission) so being able to experience the gameplay and seeing how well it works (even though we failed miserably) was one of the highlights of our weekend. Yey, another Codenames game, and this time, especially for two players! While we’re huge fans of the previous editions of Codenames, (Original, Pictures and Deep Undercover) we’ll always have a soft spot for any game which can be just as well played with two players as it can with four. I know there is a two player variant for the others, but they never work quite as well as playing in two teams. We’re thankful we can now say that Codenames Duet has successfully bridged that gap. It’s a perfect reimplementation of the original classic for two people. Each player sees only half the agents you need to locate as a team. Using traditional Codenames hints you need to work together to locate all of you agents, but there’s a twist. One agent for each player will be shown as an assassin to your partner, so at some point you’re going to have to risk picking a tile you know has a one in three chance of being an actual assassin. To combat not having another team to play against, your rounds are limited. Plus, if you accidentally pick a civilian space, your available rounds will reduce quicker. As an added bonus, Codenames Duet also comes with a campaign mode! Each game in the campaign will vary in difficulty, so you’ll need to refine those communication skills to succeed. We haven’t even taken this one out of the box yet, but as soon as we heard Stuff by Bez was bringing out a new game, we already knew that we would love it. In a Bind, which we discovered at the UK Games Expo 2016 is still one of our favourite party games, so we’re really looking forward to checking out Wibbell++, and will be bringing you a full review soon. Modern Horrors is a horribly hilarious card game from comedian Nick Swift (in his amazingly sparkly jacket). It’s basically Top Trumps with monsters of today. There’s no prizes for innovation here, but what we do have is a fun and satirical implementation of a traditional game in a relevant and fun context. We’ve already had a sneaky peek at the concept for season 2, but actually getting to touch the box is something extra special. We adored playing Pandemic Legacy season 1, and as we managed to complete the campaign still speaking to each other, we’re looking forward to playing season 2. It actually took us a while to play the original T.I.M.E Stories game, but we kinda loved it. I especially have a soft spot for these games (see previous comments under Escape the Dark Castle about my love of choose your own adventure books) and the interesting implementations of each expansion has got me begging for more. 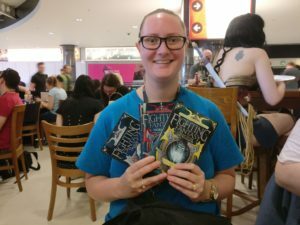 While Expedition: Endurance is my current favourite, we have A Prophecy of Dragons and Behind the Mask ready to review, and now three more titles have been announced! The newer expansions feature an additional challenge as the pressure on players is not only about time, but it also involves moral choices, a powerful opponent, and new mechanisms. Discover lots of new information about the T.I.M.E Stories universe, within a historical scenario and an intriguing setting. Just when we thought this series couldn’t get any better! Unlock! was one of the most exciting games to land in my lap this year. As an avid fan of escape games, having this concept brought to the tabletop was something we were excited to see. While the first series, dubbed ‘Escape Adventures’ had some flaws, we did really enjoy playing, and, we can’t imagine a better way of doing it. Not only is Unlock! returning with three new challenges, dubbed ‘Mystery Adventures’, but it looks like some of the initial criticisms we had are being addressed for later games. This means we’re super excited for this first expansion, and can’t wait to get stuck in (or get out…) when it arrives later this year. We also got to play Fifth Avenue, which is a new demo game, and a much nicer intro to the mechanics in the Unlock! series. Corks isn’t a game we would necessarily gravitate immediately towards at first glance. Corks claims to be a fast , fun, furious game for family and friends. A game of elimination, speed, thought, coordination, stealth and dastardly cunning. While we didn’t have chance to demo the game at the expo, we do have a copy and will be bringing you a full review soon. Have I mentioned that I’m in love with ‘choose your own adventure’ books? While we would have loved to see all the shows on at UK Games Expo this year, we have seen The Dark Room and Knightmare Live before, so instead, we opted to just see MMORPG with Paul Flannery. If you’ve ever played any type of MMORPG, and like comedy, you’ll love this show. No two shows are the same, with members of the audience making up our hero party and a large D20 helping decide their fate. Our heroes included a Dire Scorpion Mage who casts ‘bag of moths’ and can summon his familiar, Moira the Vicar, a House Elf Thief, half house, half elf, and a Beard with a Bear Warrior, (the bear was complicit, it was not just dragged along). Plus, I’m pretty sure I’ll be playing ‘Am I a Pie?’ on every long car journey I take from now on. Bowling with a D20? Yes please! 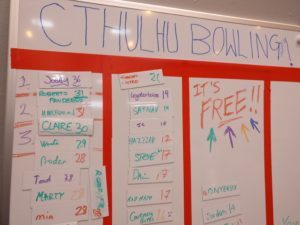 Cthulhu Bowling was brought to the UK Games Expo by Modiphius, it was tons of fun, and I even made third place on the leaderboard! I also loved Codenames Duet when I played it at Airecon, and I was already set to get it. Hearing there’s a campaign makes it even better! Thanks for the kind words – so glad you’re continuing to enjoy IAB Jr and I hope you enjoy many of the Wibbell++ games! No way! It was £119 when I reviewed, which for 7 people, puts it on par with most escape rooms. That’s a huge price increase though! That’s probably my personal favourite too – I feel like it should have already been invented, but I don’t think it has.